Bruce Steer was a local personality at the heart of Bermagui’s community in the post-war years. Bruce Steer Pool in Bermagui doesn’t get as much publicity as the Blue Pool over the headland, but actually on the right day this is a fantastic spot for a protected swim. 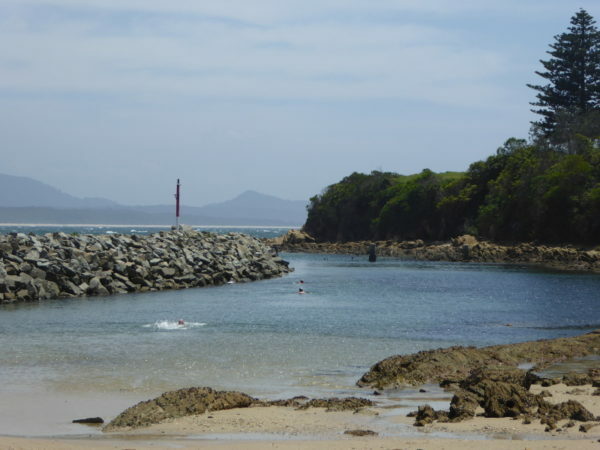 The first time I came to Bermagui (to swim in the Blue Pool), I took a look at Bruce Steer Pool but the shark net was down for repairs so I didn’t really fancy getting in, and nobody else was in the water that day. I returned on the first day of summer 2017 on our way south to Victoria. A strong nor’easterly was blowing, so the guy I chatted to by the beach here said the Blue Pool would be lively, whereas Bruce Steer Pool would be sheltered from the rough seas and that wind. Even though it was low tide when we arrived, the swim from the edge of the water on the sandy beach up to the shark net must be about 150m, so on high tide it’ll be even further. The gent I chatted with says he just swims to the net and back every day and that 300m swim is good enough for him. At low tide the first 15m or so is too shallow to swim but even in those early sections there are little fish darting about around your ankles. And once it gets beyond knee depth you can take the plunge. The water is crystal clear and when I looked from the jetty that keeps the pool calm along its side, it had that turquoise colour you see in Caribbean tourist brochures. It’s actually a wonderful spot for a swim and I was so glad I managed to get in the water for this very last of my ocean pools NSW quest. It’s always nice in places like this that others are in the water too. The man I chatted with had finished his swim for the day but another couple were doing gentle laps- if you can call them that – to the net and back in a slow back stroke and front crawl. Oh, and after the swim we took a very quick dip in the Blue Pool, too, but of course local man was right: with the nor’easterly blowing and the waves crashing, the Blue Pool was an eventful place to swim, even at low tide. The wind actually blew so strongly that it caused waves inside the pool, without the ocean even bursting over the walls. But it is a magical place and with Bruce Steer Pool there as well, I could happily live in Bermagui any day. You can park quite near the enclosure but you need to take the low road around the cricket oval going clockwise from the town. Find the harbour where a few boats are moored and follow that road round. If you get to Horseshoe Bay, you’ve gone too far. I guess at high tide you could possibly jump in off the boulders that form the jetty but the safest way in to the water at Bruce Steer is to paddle in via the beach. I didn’t see a shower here but there is a toilet block just above the nearest parking area. Possible to swim on all tides. High tide just makes it further to go to the shark net, but also means you can start swimming sooner. Hard to find any stories about Bruce Steer Pool and its past. Bruce Steer himself is featured in an information board by the pool, and he certainly sounds a larger than life character who stood out in post-war Bermagui, The pool is named after him but it sounds as if he spent more time fishing than swimming, and it’s not even clear he did swim here or anywhere else, so I didn’t get a sense of his link to the pool itself. Anyone with stories on how the pool came to be or any curious incidents since its opening, please comment below. I’d love to hear them. I got chatting with the gent who had just finished his swim on the morning we showed up. He prefers Bruce Steer Pool to the Blue Pool because he can always guarantee a calm swim here, whereas Blue Pool can be tricky in the wrong tide or on the wrong swell. This local newspaper article from 2016 talks of the damaged shark nets at the time, though locals were more worried about storm surges here than sharks. 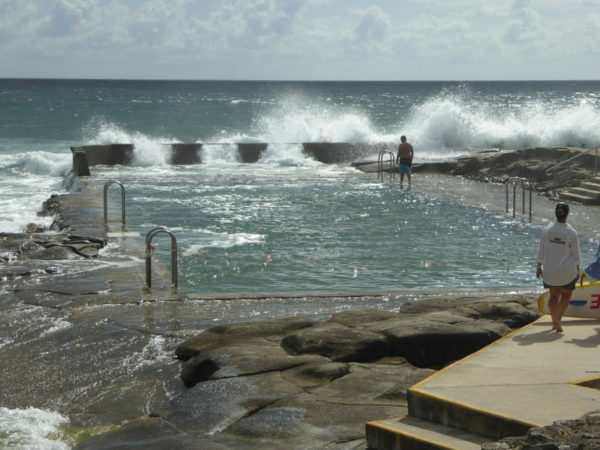 Not many blogs mention Bruce Steer pool so I had to delve back to 2009 to find this from a Scrapbooking blog, though I actually didn’t recognise the pool in the photos here. This Ankle Deep Water website has tips for safe places to take kids, though I would say the water at Bruce Steer Pool isn’t ankle deep for that long! Best alternative to Mister Jones Espresso in Bermagui. They use Danes Coffee Roaster from Wollongong, mainly because they find it hard to find a good organic coffee roaster any nearer. I know Danes from many visits to Wollongong so knew I’d get a decent brew for our post swim coffee. Hard to walk by the rows of chocolate covered nuts, but we resisted because we were heading back to the best bakers in southern NSW for lunch: that’s Honor Bread, by the way!